Well made and supportive saddle with a prestigious heritage. The rebirth of a classic design from the late 1970s, the Selle San Marco Concor Racing Fluoro Flash Edition is a firm, light, racing-orientated saddle with a touch of dayglo flair. Saddles are a very personal choice. Not only from a material, shape and width point of view but colour. Get all these factors right and you'll have a pretty decent perch. Get one or more wrong and it'll be downright painful or maybe just fidgety uncomfortable. Selle San Marco have been making saddles since 1935, based in a small northern Italian town called Rossano Veneto. The Concor model was first introduced in 1978 and is renowned for being lightweight and comfortable. The list of big race winners who have used one of these saddles is seriously impressive. Back then the original had a rounded, slim profile. The present incarnation has taken the design further by using state of the art materials and developing the saddle over two years to produce what they hope will be another winner. The Selle San Marco Concor has Biofoam padding to provide support as well as long lasting comfort. On top of this is a cover of Microfeel which is durable, soft and supple. All of this is placed upon a reinforced carbon hull. The hull has a degree of flex but is designed to remain stable under pressure and thus providing the rider with a solid and stable base to push against. The rails are made from an alloy Selle San Marco calls Xsilite which contains silicon, titanium and carbon and is claimed to be stronger and lighter than titanium. The whole thing weighs in at 190 grams. In terms of performance it hits all the spots, in the right way. There was some initial discomfort as the saddle moulded to its new position. The wings are not intrusive but on those early rides it was enough to force me out of the saddle more than I normally would. However after some regular commuting with the occasional evening or weekend ride I felt it was time for a proper test. What better way to prove your saddle is suitable than with an all day ride. The prospect of jumping out of the saddle did not appeal on a ride of this length. My fears were unfounded. There is enough flex on the wings for my thighs to find an accommodating position and when you need to exert additional power the hull is firm enough to allow you to do so. The only downside to this particular version is the fluoro green stripe right down the middle. It's not subtle, but given that most of the time this will be hidden it's perhaps a small price to pay. Talking of which the Concor is priced at £99.99 which places it mid-range even in the San Marco range. 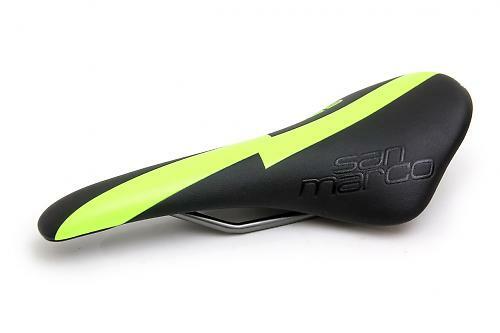 The Selle San Marco Concor saddle is firm enough to provide a solid power base but offers enough flex to provide stability even on the longest of rides. It's a well made, supportive ride at a reasonable price. This saddle is aimed at those who appreciate a strong base from which to work from but with enough flex to ensure comfort is not compromised. 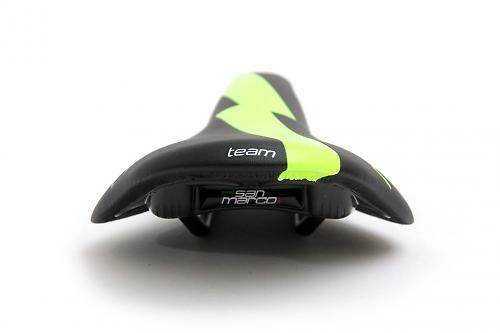 The Selle San Marco Concor has Biofoam padding to support and provide comfort. This is covered with Microfeel which is durable, soft and supple. All of this is placed upon a reinforced carbon hull. The hull has a degree of flex but is designed to remain stable under pressure and thus providing the rider with a solid and stable base to push against. The Concor is well made, with the Biofoam padding fitted well under the Microfeel covering. The rails despite being made from a Xsilite Titanuim alloy are strong and robust. Performance has increased as has confidence. My initial concerns centered on the stiffness but these fears have waned as the saddle has been broken in and now provides enough flex to make it plenty comfortable. The build quality is good, there are no signs of wear or tear even after close to 800Km. The stated weight is 190 grams so unlikley to cause all but the most weight conscious riders any alarms. 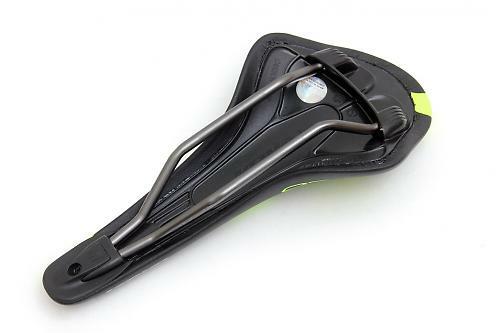 After some early discomfort and concerns the saddle has now adapted sufficiently to provide flex and stability. Given the attached price-tag you get good value for your bottom. The saddle has come up to scratch and has proven suitable for even the longest rides. The flex in the wings and the stability when you want to remain seated but put the power down. The fluoro stripe is a bit of an eye sore and a shame given the effort and design that has gone into the rest of it. Did you enjoy using the product? It was comfy. A strong perch with enough flex to allow for a comfy ride.